Ricky Ross has become adept at keeping several careers running simultaneously. When I interviewed him in 2005 he had just begun broadcasting with BBC Radio Scotland and now seven years later he has two runners up Sony Awards for his Another Country programme and also hosts a Sunday morning programme and has deputised for Bob Harris on BBC Radio 2 and made the occasional programme for Radio 4. The radio work alone would keep most people busy as there is a stream of new albums to become acquainted with, research to carry out on guests, live sessions to oversee and weekly blogs to write. He has also continued to perform as a solo artist and as well as one half of McIntosh Ross and spends much of his time co-writing for younger artists including James Blunt, Will Young, Ronan Keating, Emma Bunton, Cathy Burton, Eg White, Beth Nielson Chapman and Jamie Cullum. This year alone he has already recorded a brand new stripped down low-tech solo album which should emerge early next year and been part a multi-artist, multi-discipline play, book, album and film called Whatever Gets You Through The Night and also has been writing with Kenny Inglis for an album project to be released as Elko. All this is often done at the same time as holding the fort at home on the occasions when Lorraine is away on tour acting in another play or film. Then of course, from time to time, there is the subject of today's interview: his involvement with Deacon Blue. When I caught up with Ricky on one of the only hot sunny days in Glasgow's summer, he and his wife Lorraine McIntosh had been holding court in a Glasgow café doing a round of face to face interviews which had lasted from breakfast time into the early afternoon. Deacon Blue are back with a new album 'The Hipsters' out on 24th September and in October the band are playing concerts in Scotland and England on a three week tour. Their new record company are releasing the band's entire back catalogue in remastered audio in six case-bound book multi-disc sets. Lorraine introduces herself and gives me a warm welcome before handing in her apologies. The morning interviews began late and overran and after my interview the two of them are supposed to be available for a round of phone interviews with journalists from across the UK and Lorraine disappears to contact them and reorganise the time slots while Ricky stays on to answer as many questions as I can squeeze into 30 minutes. We begin by talking about the band's new record deal with Demon Music Group's imprint label, Edsel Records, and Ricky explains how this has been key to the new album coming out as well as all the remastered reissues. "For a while we wanted to find someone who would look after the back catalogue and it coincided with this new record. We were looking for a release for the new record and basically we put those things together and it meant that everything is going to be in the one place and long term wise hopefully everything including my solo stuff will be there as well, so I think it was the answer to a lot of different needs and I also love the people at Demon when I met them. Someone once said to me about our previous record company Sony, 'It's like walking into a youth club'. With going to Demon you are talking to people of your own age and experience and who like the same kind of music and they do the reissue stuff very thoroughly, they are very, very good at doing that. I've been really very impressed with the stuff they have put out by other artists, it is really well done." One of the other key players in putting the new album together has been Gregor Philp who joined the band in 2008 after having played with drummer Dougie Vipond in The Swiss Family Orbison and written and produced a range of work for film and TV including Balamory, Monarch Of The Glen and Taggart. As well as co-writing a few songs on 'The Hipsters' Gregor was also responsible for working with Ricky on the demos for the album and also recording Ricky's next solo album which was completed earlier this year. Ricky explains, "Gregor is such a great friend of everyone. He is a very good personal friend of Dougie's and he has become a good friend of ours, Jim and Lorraine and myself. We're very close friends now. It's lovely when that happens." I ask him about "The Hipsters" video which is now online at the band's official website and on You Tube. The track is the first opportunity for fans to hear something from the new album. "Well the video is good because we're not in it!" he chuckles. "We wanted to make a kind of viral thing. I don't think videos really have much of a life other than being viral these days. So we wanted to make something where people would say, 'Oh look this is something that I got sent on my facebook page, do you fancy having a look at this?' So it almost looks as if it is just a piece of film that happens to have our music running with it and I quite liked that idea. So it's a really cool piece of film made by Jack Laurence at Armoury. We scouted around for these young very good film makers and designers and it all involves kids and it's really good." A few weeks before Deacon Blue went into the studio to record the new album Ricky returned to Brazil's MST project with a group from Christian Aid. He explains how the trip came about and what he felt about the visit. "I'd been there in 1998 and the folk out in Brazil asked if I would come back and see what had been happening since then. So it kind of really was to do with that. It was a really great trip, lovely people and a great cause. Often when you do these things people fully expect to hear a story of heartache and sorrow, you know, 'I went out to see a project in the third world - Brazil is not third world obviously but it's that kind of development situation - and it's really tough and I want your money'. It was quite nice to say, a) it wasn't heartbreaking and b) I don't need your money, as they are well supported, but if you are supporting Christian Aid it is good to know that your money is going into these real development projects where they are allowing local people to make a lot of decisions about their future and I think that is a pretty good model as well. So, Christian Aid are not the only people who support MST; Oxfam and a lot of the major charities do as well but MST is a great movement and I think people will hear a lot more about Brazil over the next few years. In two years time they're hosting the World Cup, four years time The Olympics and in between then I think the Pope is going to be there, so there is going to be a whole lot of stuff about Brazil and I hope that their story will be able to get told." We turn our attention back to Deacon Blue and speak about the fact that it has been 11 years since their last full length studio album and two and a half years since Ricky announced the band were taking time off from their concert schedule to make time to write and record a new album. I ask if the process took longer than expected. "Yes, it has taken a while," he laughs. "I initially thought that if we did an album it would come out last year. I kind of knew that 2012 was an anniversary year even though the anniversaries are a bit vague. Did we get together in '85? Yeah, kind of." The first Deacon Blue gigs took place that year even though the line up changed right up to the release of 'Raintown'. "We sort of got together in '86 but our first album came out in '87." It was only after the debut album's release that Lorraine became a permanent member of the band. "So this is sort of the 25 year period. We wanted to do something around this time and if we were going to do a tour - I just felt that we could tour and a certain amount of people would come and see us doing old material, but I felt that to go out and tour with old material again would be really hard especially when we are always writing new songs and not to do any of that stuff would be really hard. I just thought that's depressing and you don't want to go out on a tour and feel like that. Much as it was really lovely to do some of these things, it was always good to do new material whenever you had it." With the new album now a reality and the band pleased with the results the prospect of going out on the road again with new material to play appeals to Ricky. "Now I am really excited about going out not because we are going to play wall to wall new material, you wouldn't want to but it's just nice to get the chance to really hear the new songs in front of an audience." Ricky begins to chart the long and winding process which led to the album being written, demoed and recorded. "It was about two years ago in the summer I had a meeting with the guy who was going to become our manager, and he did it for a year and then it didn't work out but in a very amicable way. But he sort of inspired us and said, 'You've got to make a Deacon Blue record'. I was really going in to talk about the next McIntosh Ross record as Lorraine and I had a couple of songs already demoed and we had some stuff written for that and I was thinking that was the next project. As it happened he said, 'No, you've got to make a Deacon Blue record'. I thought, 'Well if we're going to make a Deacon Blue record I'm damn sure we're going to make a good one and I really need to knuckle down'. I just thought if it's a Deacon Blue album we've really got to concentrate on it. I sort of control my own schedule. Normally I would be writing for other people and I just thought, right, Lorraine's going off on tour, she's off in a play, I'm just going to put the next few months aside and work on writing songs and every few days or so I would get one down and I'd phone Gregor and say 'Do you fancy coming through, Lorraine's away and I'm looking after the kids, come and stay and we'll work on songs'. So it was great. I would get up in the morning and get the kids to school and Gregor and I would work and we'd stop at tea time then later on get Seamus to his bed because he's the youngest one and then invariably we'd go back and start recording again. So it was really great for working, having the studio in the house. That was really when a lot of the work was done, 2010 and 2011, I would say." 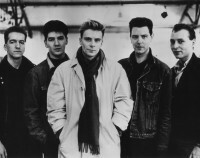 In 2010 a 10-song Deacon Blue demo compilation had been lodged with Ricky's publishers Warner Chappell Music and a few songs were included which didn't make the final cut, "Kind", "I'm Not Supposed To Care" and "This Year's Drug Of Choice". By the spring of 2011 the band had finished recording two new songs in the studio and fans began waiting expectantly on a release date and news of a tour. The band played a handful of summer dates where one new song "That's What We Can Do" was unveiled but there was no news on when the album would be released. If the process took longer than originally anticipated then the delays had some benefits in the shape of new songs written after the first set of demos had been lodged with the publishers the previous year. "We had everything done demo-wise, we had everything done a year past in the spring and then the nice thing that happened was we had three key songs which happened after that and they were "Stars" which Gregor and I wrote together, a really important song "Is There No Way Back To You" which came later on and also a really important song "Here I Am In London Town". All these sort of happened and so it was kind of worth waiting for." When the album sessions got underway the band turned to former Delgados drummer Paul Savage to engineer and produce the project. At first glance he seemed a surprising choice given that most of the acts he had previously worked with were indie hipster acts like Franz Ferdinand, Belle And Sebastian, Mogwai, Teenage Fanclub and Arab Strap. However, Ricky's work in radio meant that he began to notice a steady stream of great albums which were bearing Savage's name in the credits as engineer or producer and in 2011 Savage picked up the Music Producers' Guild Breakthrough Producer 2010 award. Recording took place in the newly built Gorbals Sound studios and also at Chem19 outside Glasgow. Ricky explains the choice of producer. "Initially, we were looking for someone fresh that would work with the band live, and also initially we were looking for someone that was nearby because we thought well you can go round the world and sometimes I question that whole thing and then other times I go oh aye, and we go off to California and record ['The Great Lakes']. I just thought when a couple of records started to arrive on my old horizon then you are doing something right. The Sparrow And The Workshop thing was the first thing that I heard he'd done and I thought that's really good and then when I met him to chat he said, 'You should listen to Admiral Fallow' and that was really good, in fact the new one is really good. I love the whole natural sound of it and also just the imagination in it without being clumsy, without being 'producerly'. The next thing was to try a couple of songs. We did two songs with him [in spring 2011] and we really enjoyed it." When it came time to choose a producer, the band decided to stay with Paul as they were happy with what he had done with the demos. I ask Ricky how many songs the band cut at the sessions in the hope that we'll get to hear some outtakes as b-sides or downloads at some point. "We recorded just 13 songs because we were really short of time. So there were more demos recorded but we had 13 songs and it was just a case of just knocking off two. Actually, Tim Young, who mastered the album and has mastered all my previous albums, said he thought the songs were good enough to keep on the record. But I like my albums to be a set length. When CD became the main format for albums lots of people began making albums longer just because you could. I like albums to be about 40 minutes and I actually think 'When The World Knows Your Name' was too long and had too many songs on it." After the 13 songs were recorded the band brought in Ash Howes to remix a couple of tracks before the album went on to be mastered and readied for release. Next we chat about the album cover and the fact that once again the band members are not on the cover! I ask where the photo was taken and what it represents. Ricky begins by joking that it is a good thing the band members are not featured. "I always think our sleeves have been great because of that," he kids. "I've loved these photographic sleeves. The temptation is to go back and do a '60s black and white nostalgia but that's not what it's about. We wanted to get something that was kind of modern but slightly off-kilter modernist and we were looking for hipster images. The trouble was they were coming up very literally. You just have to go through images until you find something and so we found this bowling alley we really liked and that was kind of sad. It was like an American bowling alley that had long-since stopped being used and I said 'I really like that' and the designer said 'actually we've got some more'. We picked this other one and it just had a slightly detached thing which probably asks as many questions as it answers. We all went 'Yes, that's it'." I mention that I had spotted that a few of the songs were co-written with the band's new guitar player Gregor Philp and Lorraine and invite Ricky to tell me more about those collaborations. "Yes, and I also wrote 'Turn' with Eg White. Well Gregor was about so I would just say to him, 'Look why don't we write together?' and sometimes I would just start things and say 'Look, we've started here, we're co-writing now!' and he'd say 'No, we're not!' and I'd say 'No, no, no, I want your input', so for example 'The Outsiders' was very much like that. I said, 'Look, we're just throwing ideas down very, very quickly'. With 'Is There No Way Back To You' Lorraine came up with this melody for this chorus and I said 'That's brilliant, I think I may have a verse for that'. We were trying to punt it to someone else, someone was looking for a song for something and we did a version which was just piano and vocal and strings. Then the song just hung around and I sang the demo and then I thought it would be great for our album. It was just at the last minute and we tried it one night and went through it very quickly. Jim's keyboards on it are beautiful because he starts this thing and it just kind of builds and builds and builds. It's great."